FREQUENCY: As needed; once or twice a year or in between tenant rentals. CLEANING TIPS: To clean the guide wear strip, gently wipe using a soft cloth with a silicone‐based restorative protectant solution. To clean the bottom bar astragal, gently wipe using a soft cloth with silicone‐based restorative protectant solution. To clean the curtain and latch assembly, use warm water and a mild detergent such as a dish washing liquid. MAINTENANCE TIPS: DO NOT ATTEMPT TO DISASSEMBLE THE BARREL AND GREASE THE SPRINGS. No maintenance is required for the springs located inside of the barrel. Check the door operation operation to make sure that door is working working well. If during operation operation the door is hard to open or hot off the floor, the tension will need to be adjusted. Should spring adjustment be necessary, refer to detailed instructions posted on our website. clearance to safely stage the barrel assembly and perform the take down. 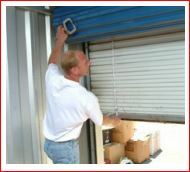 Remove any objects in the unit that obstruct or infringe upon the work space. procedures for removing tension before continuing further. 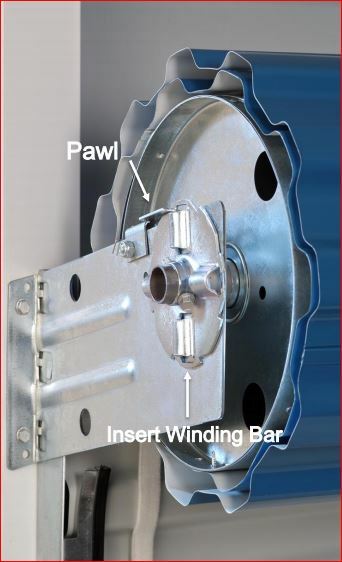 4: Identify the location where the brackets attach to the wall and whether there is 4any additional guide attachment. 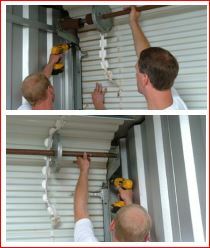 Make note of the configuration for step #7.
the curtain is rolled over the top of the axle assembly and is accessible. bar to hold the curtain into place. curtain to the axle assembly. attachment between the bracket and the guide, then skip down to part (D). the screw gun and then skip down to part (D). loc tab before you are able to disengage the bracket tab away from the guide slot. Once detached, proceed to part (D). (D) Clamp the drum of the axle to the curtain assembly with the 3rd "C" clamp. Repeat the same steps (A) thru (D) on the other bracket. 9: Line the hole on the brackets up with the holes left in the jamb. supplied. Repeat this step on the other bracket. secure with a vice clamp. 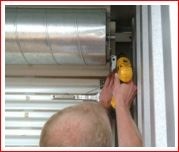 11: While secure, fasten the curtain to the barrel in 113-4 evenly spaced locations. 12: Once secured, remove vice grips from the curtain, 12 as well as the guides. operation and repeat as necessary.